Contemporary American artist, Michael Bryan’s works have been exhibited throughout the United States since the early 1980’s. His poster designs are continually commissioned by numerous organizations, corporations and special event committees; the notable list includes In-N-Out Burger, Porsche, Bentley, Harley Davidson, The Los Angeles Marathon, Atlanta Olympic Games, San Diego Chargers, Pepsi and BMW and the CBS Television Network. A Chicago native, Michael Bryan studied at Southern Illinois University, Amonson College, Mayfair College, Art Institute and Northwood Institute. He received his graduate degree from Elgin College in Elgin, Illinois. He served in the U.S. Army from 1969 to 1971 in Special Services. He continued to develop his art, showing in innumerable collections and prominent museums, including the Kentucky Derby Museum, Kentucky, and the BMW Museum, Munich, Germany. In 2008, Michael began his aviation series. From corporate jets (Avanti) and Flying Tiger to World War II B-17 and B25 bombers, P-51 Mustangs, spitfire pilots and ME-109’s, he has brought to life, the live action of these magnificent flying machines in all of their glory. 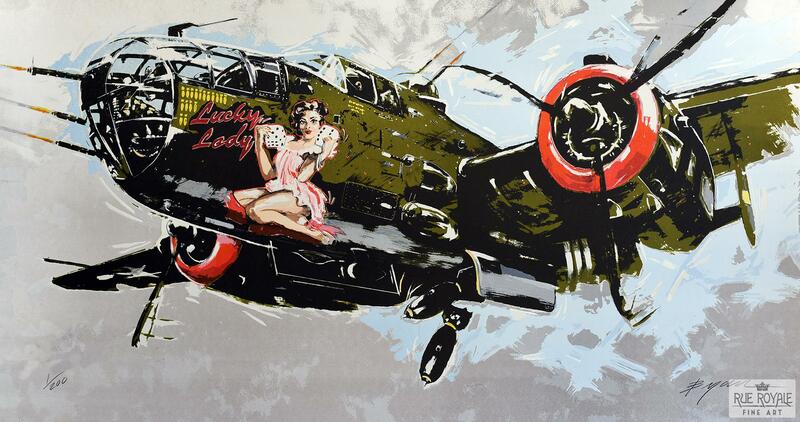 Rue Royale is pleased to be collaborating with Michael Bryan in creating authentic hand pulled lithographs of his most recent work on aluminum panel, LUCKY LADY. Printed on a 1940’s German Dufa press, Michael hand drew the mylars and worked in tandem with master printer, Dan Woodward to deliver a dynamic 16-color process print on Rives paper.